Sheila Khan is a sociologist, currently a postdoctoral researcher on the EXCHANGE project (2015-2020) funded by the European Research Council. 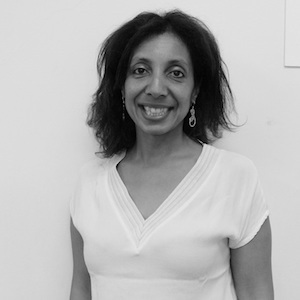 Sheila has a PhD in Ethnic and Cultural Studies from the University of Warwick, and has focused on post-colonial studies in her academic career, with a special focus on relations between Mozambique and Portugal. Among the themes she has worked on are: contemporary Mozambican and Portuguese history and literature, narratives of life and identity from the Global South, authorities of memory and memory as a duty of memory and civic courage. Shelia is author of Portugal a lápis de cor. A sul de uma pós-colonialidade ( Almedina, 2015) and co-editor of Visitas a João Paulo Borges Coelho. Leituras, Diálogos e Futuros (Almedina, 2015). Since 2014 she has been a commentator on the panel of the African Debate program of the RDP Africa.